Fished the Russian River today for trout. Fished with Salmon swirl bead. Really the first time that I put 100% effort into fishing the river for trout. Right off the bat hooked up with a very nice rainbow that measured 27 inch. We fished all the way down from Garyling parking lot to the confulence. We hooked allot of fish and lost allot. It took some time for me to learn how to fish with a bead and to fight these fish with 6lb tip it line. Also caught allot of Dollies to. Here is a pic of a dolly. For a week day there were more people down there today then what I thought would be. About two dozen people there. No bears today. Sounds fun. If i go down again this weekend I'm bringing my 6wt for sure, last weekend i was stuck with my 8wt and for those smaller fish it was a little to easy to horse them in, lol. I was glad I had it for the silver though, it was one of the biggest I've caught. 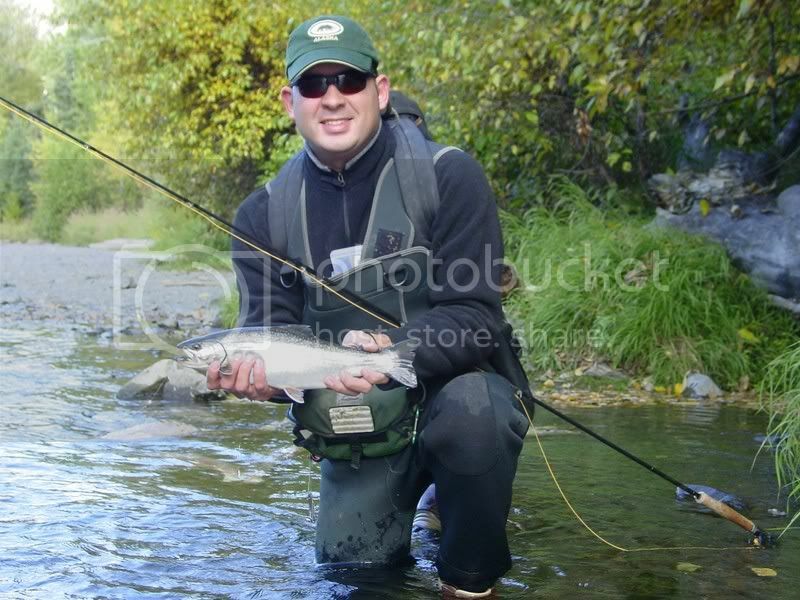 Nice job Gary, I'll be down fishing the confluence of the Kenai outlet into Skilak from Wednesday-Sunday. Yep, finally moving off the salt! I figure its a good way to run some fresh water through the engines. This can be a great fishery for about anything that swims in the river. I'll provide a report when we return. Cheers! I loved it yesterday. Not allot of people and a ton of fish. WE hooked some monsters yesterday. There were a couple of time that as soon as the bead hit the water. They smacked it and ran. The trout we lost nothing over 30' but some nice high 20' trout. I was lucky enough to land that 27'. I can't wait to go in two weeks. I took my friend who I met in Iraqi and then was lucky enough to get stationed here on Elmendorf. He could not of been any happier. One thing there were more pinks in the river then I thought there would be. Flyguy. I need to winterize my boat next week. The pic looks like it was a great, sunny type of day. Well the morning was very chilly. I wished I brought some gloves and a cap. But as the day went on it got warmer. It was a overcast day. The bugs were out. Glad to see that it was a good trip. That is a great stretch of river to fish this time of year. I wish I could get one more day on the water but it is a long run from Texas to the Russian so I am done for the year. I'm hopefully next year will go after sheefish.